‘A number of the proposals will be of more interest to people living in the north of the county and neighbouring areas. Some of the proposals have a wider impact and so we are keen to encourage people from across Oxfordshire and surrounding areas to give their views. We also welcome the views of our voluntary sector partners, groups representing particular communities, other public bodies and staff in health and care organisations’. 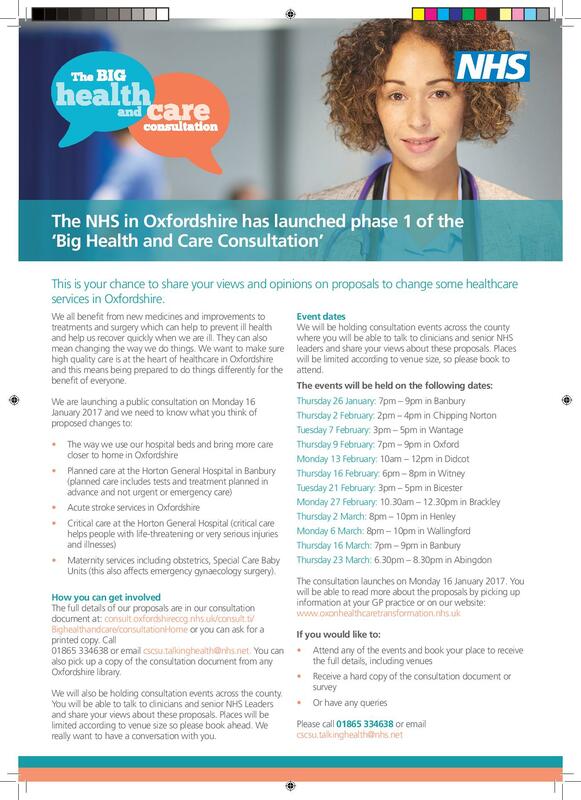 The Oxfordshire’s health and care services – The Big Consultation – Phase 1 is available here. You can access the consultation documents here and an the online patient experience survey here. This entry was posted in Posts by Horley Views and tagged Big Health and Care Consultation, Horton Hospital, NHS, NHS Consultation on January 27, 2017 by thehorleyviews.